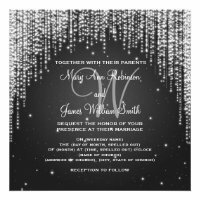 If you are looking for some elegant and modern Winter Wedding Invitations, then check out these easy to personalize winter wedding invite templates from the best indie designers out there! Quantity discounts apply with every order of over 25 invites (check product pages for more details). One of the great advantages of planning a winter wedding is that, provided you don't want to marry on Christmas Day, many venues will be far less expensive than they are in the summer or the fall. However, there are some other things that need to be taken into consideration such as the fact that it may well be cold, and you will need to plan your wedding dress and your bridesmaids dresses differently from the way you would if it were summer. > Obviously, the first thing is to set a date and a venue. You may even want to consider the venue first to make sure it's available and then set the date around that. 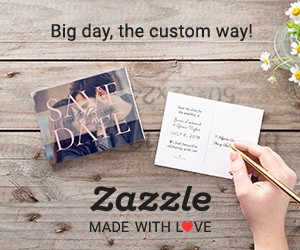 > Next is to send out our "Save the Date" cards. Many wedding advisers recommend sending these out a year in advance and certainly six months in advance. Of course, it may be that you've got engaged and just can't wait to get married, but give as much notice as you can, since many people plan winter holidays and Christmas festivities well in advance. > Now choose the wedding invitations. 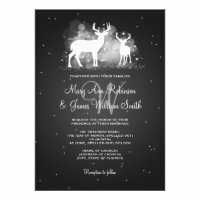 We have a range of wonderful winter themed invitations for you to choose from, or you can use our website to create your own. Once again, these should be sent out as early as possible. 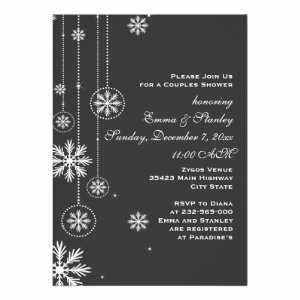 > Choose winter inspired colors for your wedding theme. Icy blue, snow white, greens, crimson and jewel tones all work well. Remember that you probably won't be able to do much outside - nothing at all if it is raining. Of course, if it has snowed and the sun is then shining you can get some great photographs, but you can't predict it weeks or months in advance. You really need to make two plans - one for if you can get some outside shots and another if you can't. Of course, you need to ensure that your reception room is warm, but that the heat can be controlled; if you suddenly fill an empty room with a hundred people it can heat up fast, even in the depths of winter. Consider the food. In the summer, cold salmon may go down well, but in winter you might want to serve winter food such as steak and kidney pudding, hot pies, roasts and so on - things to warm your guests up on a cold day. Mulled wines, hot toddies and Irish coffees will all go down well. Use winter decorations for your decor. Pine cones, mistletoe, holly, any plants with bright berries will all look great and many can be gathered free of charge from the yard, or the local countryside. So there are a few tips for your most special day. Planning in advance is key, and remember to get your invitations out early if you want to ensure that all your relatives and friends can be with you.